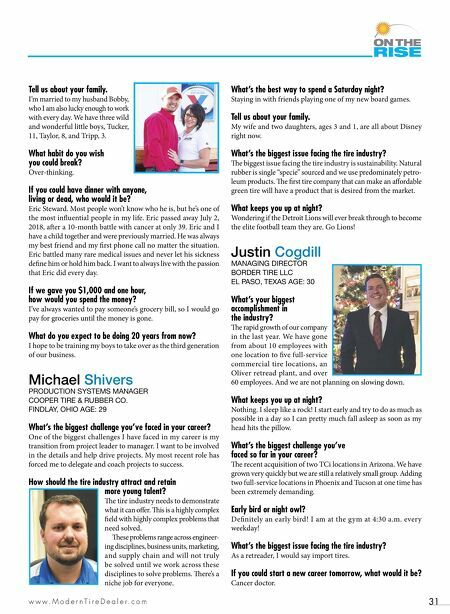 M T D N o v e m b e r 2 0 1 8 30 Joshua Singer WAREHOUSE MANAGER K&M TIRE INC. WICHITA, KAN. AGE: 33 Growing up, what was your dream job? Stunt driver for film and television. Still is and I believe it could still happen someday. Tell us about your family. My wife of nine years, Stephanie, and I have four children together. Two are still with us: Skysan, 8, and Avryn, 3; and two are waiting for us in heaven: Ellowyn and Aden. Best way to spend a Saturday night: I'm an outgoing introvert, so while I can sometimes be the life of the party, I very much value my alone time to recharge. You'll usually find me playing a video game long into the night aer the rest of the family is in bed. What's your secret superpower? I used to be a gymnast, so I'm pretty flexible and can walk on my hands proficiently — not sure I can do the back flip anymore, though. What game show would you most likely win? Probably Wipeout. I was a stunt tester for the show once and con- sidered the obstacles rather easy. If you could spend a day supporting a charity, what would you do? I would volunteer my time for Bridget's Cradles, whose mission is to provide hospitals with knitted and crocheted cradles to hold babies who were born into heaven in the second trimester of pregnancy. I can't knit or crochet, but they have other services that they need volunteers for. My wife volunteers a lot and I help out when I can. Natalie Griffin PRESIDENT BEST-ONE TIRE OF CROSSVILLE INC. CROSSVILLE, TENN. AGE: 33 Growing up, what was your dream job? I always wanted to be a country music singer. My customers. ey are incredibly loyal to those they trust and I know if we do the right thing for our customers everything else will take care of itself. What is your biggest accomplishment in the industry? Owning and growing my business from my dad's shed selling tires online at age 18 to selling tires to some of the biggest companies in Lincoln, Neb., at age 21. is means a young man can step into the tire industry and be successful even without anyone's help. We are not a fih generation tire shop; we are just people who work hard and want to help others get the right tires on their vehicle. 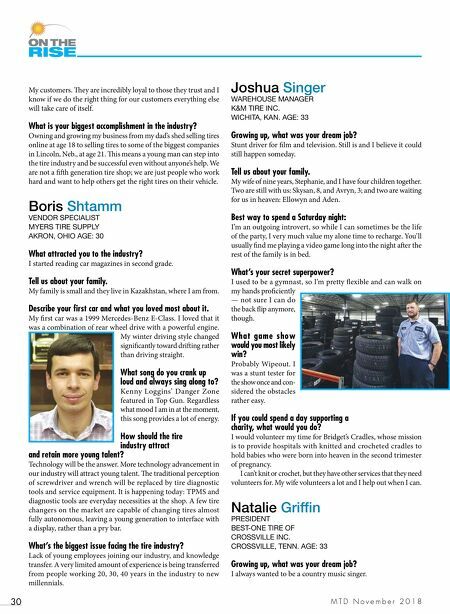 Boris Shtamm VENDOR SPECIALIST MYERS TIRE SUPPLY AKRON, OHIO AGE: 30 What attracted you to the industry? I started reading car magazines in second grade. Tell us about your family. My family is small and they live in Kazakhstan, where I am from. Describe your first car and what you loved most about it. My first car was a 1999 Mercedes-Benz E-Class. I loved that it was a combination of rear wheel drive with a powerful engine. My winter driving style changed significantly toward driing rather than driving straight. What song do you crank up loud and always sing along to? Kenny Loggins' Danger Zone featured in Top Gun. Regardless what mood I am in at the moment, this song provides a lot of energy. How should the tire industry attract and retain more young talent? Technology will be the answer. More technology advancement in our industry will attract young talent. e traditional perception of screwdriver and wrench will be replaced by tire diagnostic tools and service equipment. It is happening today: TPMS and diagnostic tools are everyday necessities at the shop. A few tire changers on the market are capable of changing tires almost fully autonomous, leaving a young generation to interface with a display, rather than a pry bar. What's the biggest issue facing the tire industry? Lack of young employees joining our industry, and knowledge transfer. A very limited amount of experience is being transferred from people working 20, 30, 40 years in the industry to new millennials.